Francis Graham Balcombe was born on 8th March 1907 in Manchester, later moving to Southport. Scouting activities took him to the Lake District whereupon he developed an interest in rock climbing. A job with the Radio Branch of the Post Office Engineering Department brought him into contact with John Arthur ‘Jack’ Sheppard, two years his junior. Balcombe introduced Sheppard to climbing and the pair soon found themselves at the sharp end of the sport. A chance encounter with a group of cavers diverted their attention to the underworld and, when the pair were transferred to work on the Portishead radio station near to Bristol - the scene was set for events told in this book. 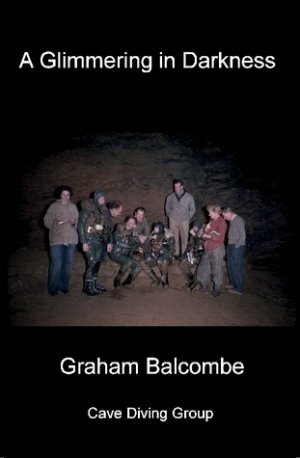 Balcombe's retirement from active cave diving in 1957 did not diminish his interest in the activity and he remained an inspiration to younger generations of cave divers - contributing materially to their activities by the gift of battery powered drill for use beyond Far Sump in Peak Cavern. Eczema on his legs led to the adoption of the inimitable Balcombe kilt. Balcombe survived his wife, Mavis (née Dickenson, they were married in 1941) and after her death cared for his sister until she died. In later life he re-established contact with a former fiancée, Ann Turner, and the two became engaged again. After a spell in care, he returned home to help clear out his belongings but was taken ill and rushed into hospital where he died, aged 93 on 19th March 2000. Jack Sheppard’s contribution to the genesis of cave diving is often overlooked. University studies and overseas service in the Royal Signals during World War 2 limited his involvement, but Sheppard was instrumental making contact with Sir Robert Davis to understand diving theory and arranging the equipment for the early Wookey Hole dives. Sheppard survived Balcombe by 16 months, passing away on 14th July 2001. His implacability made a good foil to Balcombe's doggedness and organising skills. Balcombe originally penned his memoirs in 1987, but the manuscript received only a modest circulation at the time, acquiring an almost legendary status. In the centenary of the author’s birth it is appropriate to make this document available to a wider audience. The source electronic copy of this book was kindly provided by Dave Irwin along with photographs from Balcombe’s personal collection and that of the late Bob Davies which have been used to illustrate the text. The latter are reproduced with permission of the trustees of the Wells & Mendip Museum. Other photographs were kindly provided by Phil Davies, Clive Gardener and Chris Howes. The contents of this manuscript were corrected by reference to one of the few hard copy “editions” of Balcombe’s original text belonging to the late Bob Drake. Sadly, Dave Irwin died in March 2007 and I would like to express my sincere gratitude to him for his advice and encouragement in publishing this work.